Velvet Ice Cream. A family tradition. I don’t remember my first visit to Ye Olde Mill in Utica, Ohio. It was probably B.S. (before school) and I admit, my memory is not impeccable. There’s much I’ve forgotten over the years. However, I do remember my first visit to the mill with my own children. My husband had taken a day off work and we decided to take a drive from our home in Mansfield to Dawes Arboretum near Newark. The morning air was cool with a slight drizzle. Not enough rain to keep us inside all day, but just enough to be a bit of a nuisance as we explored the cypress swamp in search of frogs and salamanders. We opted to drive through the property and climb the observation tower to look out over Dawes Lake and view the name, Dawes Arboretum, spelled out in various shrubs before jumping back in the car to head for home. We’d lingered at the arboretum, home was an hour away, and the kids were hungry. 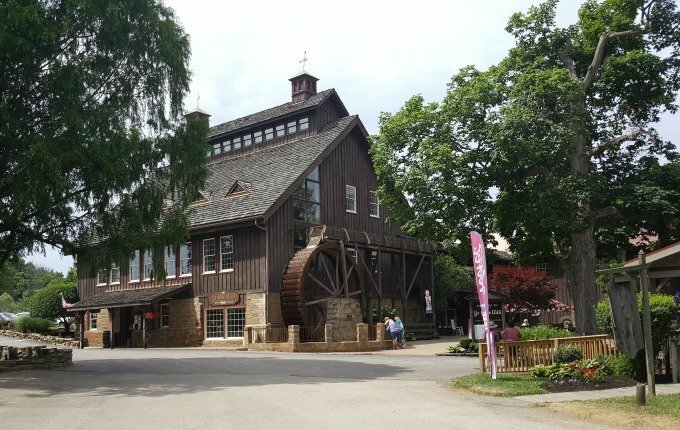 Not eager to have our fun outing come to an end, we found ourselves pulling into the drive of Ye Olde Mill, home of the Velvet Ice Cream factory. 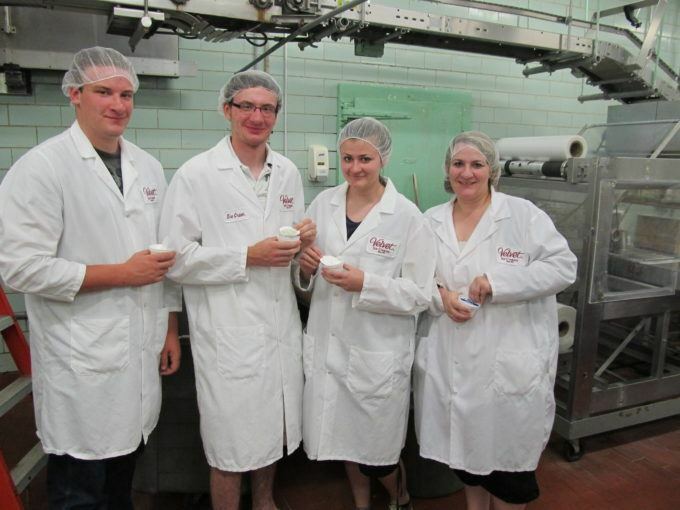 This historic property is home to Velvet Ice Cream and what Frommer’s has named one of America’s 10 Best Ice Cream Factory Tours, a tour that my now grown children have since experienced firsthand. 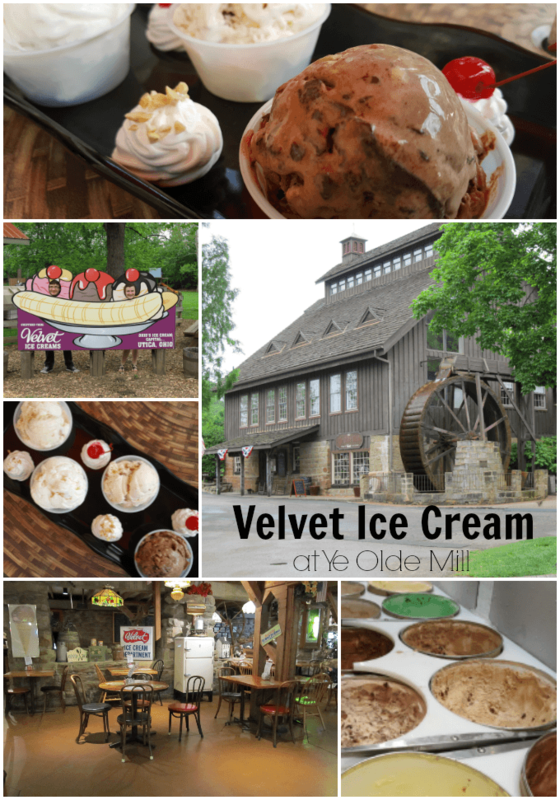 While Ye Olde Mill has a host of on-site family friendly activities that include a café, visitor center, ice cream museum, viewing gallery, children’s play area, petting zoo (on weekends and special occasions) and nature trail, my family has always stopped for one thing- Velvet Ice Cream. Do you blame us? 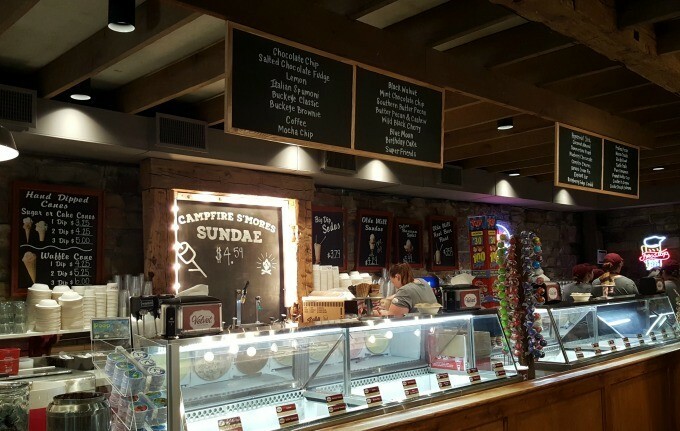 The ice cream is amazing and the introduction of new flavors keep us returning over and over again as we road trip through Licking County. 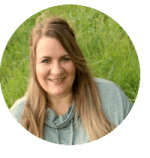 This family owned company has been owned and operated by the Dager family for five generations. In 2014, Velvet Ice Cream celebrated 100 years of business. 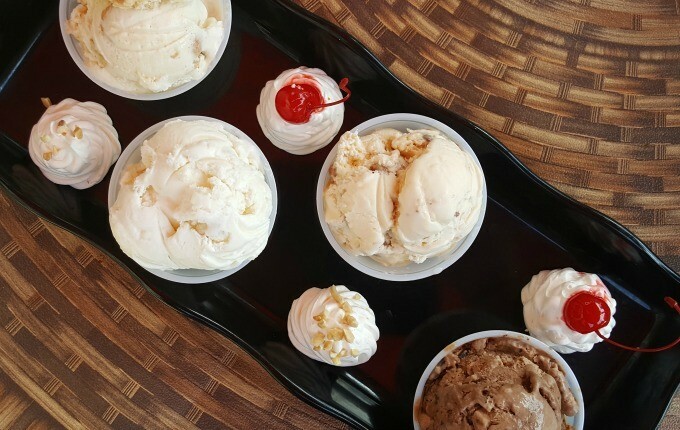 This year they’re celebrating ice cream season with new flavors which include gelatos and new restaurant menu items at the onsite Wheel Room Restaurant. Just check out this amazing Asian Chicken Salad with Peanut Sauce I had while I was there. It was delicious. New menu options also include a Santa Fe Chicken Sandwich and the ability to build your own salad. 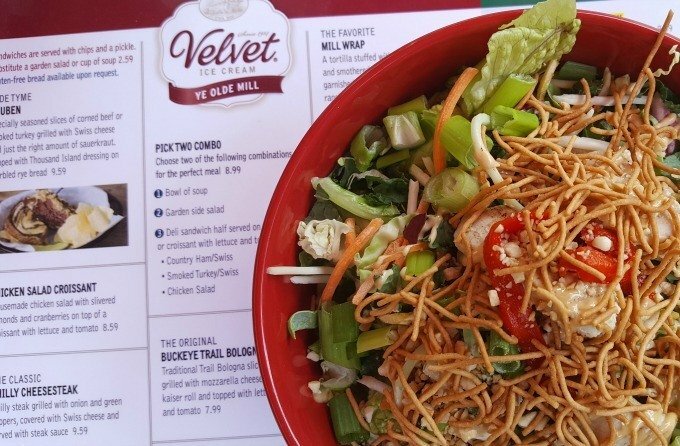 Start with a base and vegetables and then add specialty items such as rice noodles, cranberries or almonds, before adding your choice of cheese and proteins. So if you want a quick salad with a sandwich, you can build something light, or if you’re hungry, you can build a more filling salad. 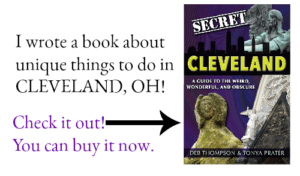 Of course, you’ll still find classic selections on the menu like the #1 selling Olde Tyme Reuben on marbled rye, or the Original Buckeye Trail Bologna which is grilled to perfection for those, like my husband, that like that sort of thing. After lunch, I had an opportunity to taste test some of the new flavors of Velvet Ice Cream. I know, my job is terribly demanding isn’t it? I sampled Kentucky Praline Pecan, Banana Cream Pie which happens to be the Ohio State Fair Ice Cream flavor, Blueberry Cheesecake and Salted Chocolate Fudge. I wasn’t able to try the new Campfire S’mores flavor, as this ice cream is such a good seller that it was sold out during my visit. 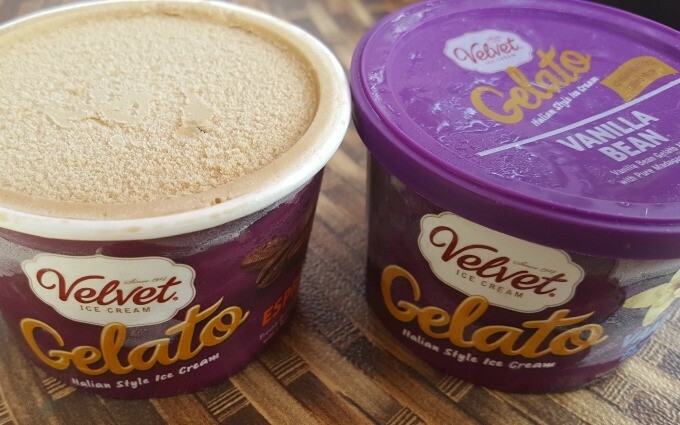 If you prefer gelato, Velvet Ice Cream has four flavors to offer- Vanilla Bean, Espresso, Double Dark Chocolate and Salty Caramel which are served in 5 oz. cups. I sampled the Vanilla Bean and Espresso and found both smooth and delicious. While all of the flavors were yummy, and the Banana Cream Pie surprised me with its light and creamy pie-like flavor, Elephant Ear is my new personal favorite. How could one go wrong with creamy vanilla ice cream swirled with caramel and pieces of cinnamon and sugar dusted elephant ears? Now that I’m thinking about it, I may need to run to my local Kroger to pick up a carton! And finally, for those interested, there’s a little friendly and tasty competition going on at the ice cream parlor. 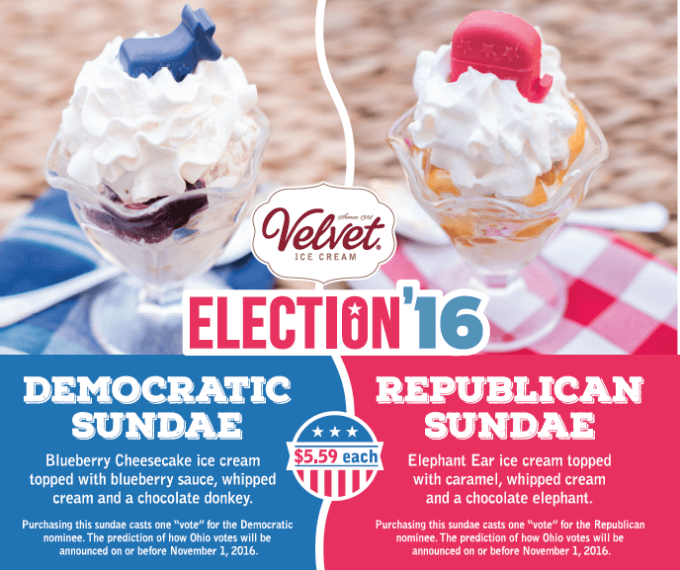 Cast your vote for this year’s election when you purchase either the Blueberry Cheesecake Democratic Sundae or the Elephant Ear Republican Sundae for some light-hearted fun. Ye Olde Mill is keeping track of how many of each sundae is sold and will announce how they think Ohio will vote later this fall. Are you ready to visit this fun and tasty perfect road trip destination? Stop at Ye Olde Mill for the food. Stop at Ye Olde Mill for the ice cream. Finally, stop at Ye Olde Mill for the memories. You never know, that first stop may be the start of a delicious family tradition. 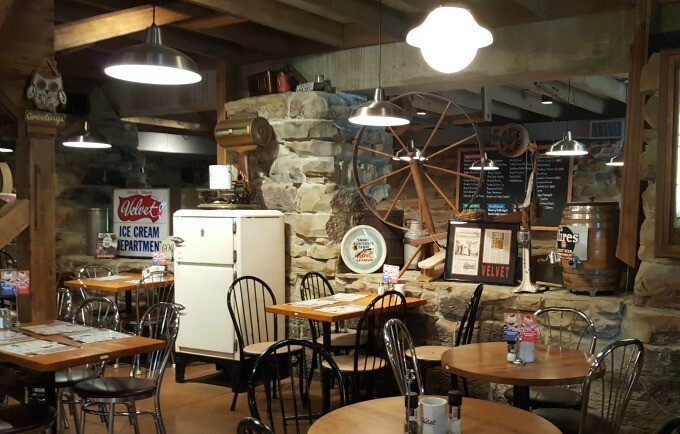 Plan your next visit to Ye Olde Mill by visiting this website. You can also follow Velvet Ice Cream on Facebook and Instagram for a chance to win great prizes- like yummy ice cream, duh!